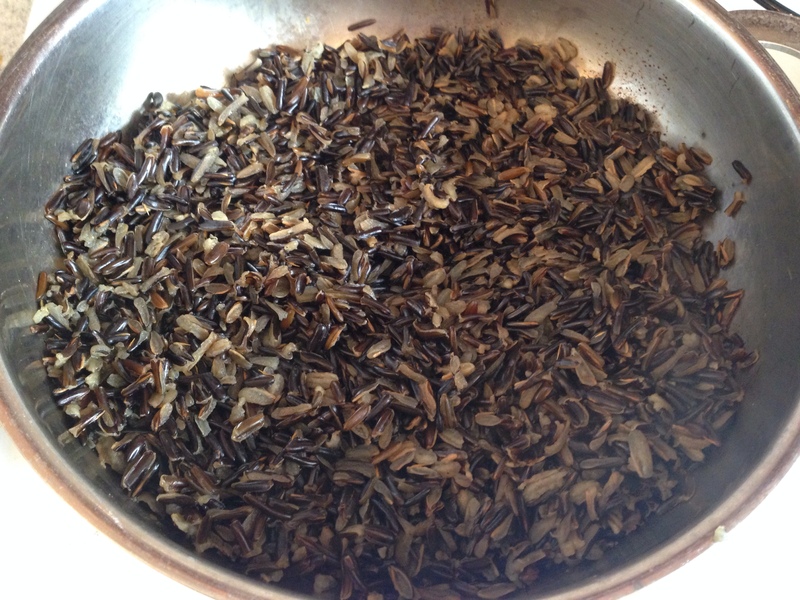 Wild rice is one of those great grains that is too often overlooked. It has a great nutty flavor and a bit chewier than other rice and is good eaten as hot dish as well as cold. Wild rice is a “good” carbohydrate; it has fewer calories per serving than brown rice, higher protein levels and a lower glycemic load. When cooked to it’s fullest, wild rice grains “pop” and the grains are no longer the thin black grains that often appear in mixed rice dishes, but rather become a heartier, plumper grain and lighter in color. The key lies in letting the rice cook a long time with a lot of liquid. I use chicken stock but you can easily use vegetable stock or water to cook the rice. I also add the liquids in stages to gauge how the rice is cooking. Different pots and different flame levels affect how the rice cooks and how much exact liquid you will need, so I start with 2 cups of liquid for 1 cup of rice and then add a half a cup at a time at the end. The total is about 3 cups of liquid and it takes about an hour and a half to cook. It freezes well after it has been cooked so if it becomes one of your favorites, you can make it when you have the time and freeze it. I like it as a side dish to Judy’s Chicken, as it mixes with the mushroom lemon sauce quite well. 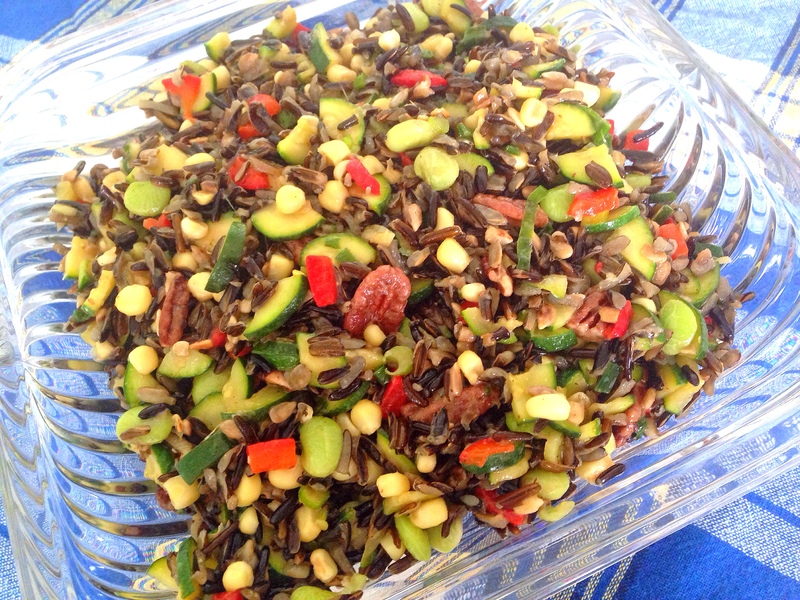 In this recipe, the wild rice is served cold as a salad with zucchini, lima beans, roasted red peppers, corn, pecans, sunflower seeds and scallions – a great dish for spring/summer barbecues. It’s a good hearty salad for those who are gluten free and vegetarian or vegan if you cook the rice with water or vegetable stock. The zucchini is blanched for about a minute to a minute and a half to bring out the sweetness. It’s cooked al dente so be careful not to over cook or it will be too soft to stand up to the heartiness of the rice. The corn and lima beans are blanched for about a minute; and the pecans and pine nuts are toasted. The dressing is very light – orange juice , red wine vinegar, olive oil, mustard, salt and pepper – and just enough is added to coat the ingredients and bring out the flavors. You can use almost any mix of vegetables and nuts that you like. Dried currants or canned mandarins can also be added if you want to add a sweeter tang to the salad. Add 2 cups of stock and 1 cup of wild rice to a pot and bring to a boil and simmer covered until the liquid has absorbed, about 1 hour. Then add ½ more stock and simmer covered for about 15 minutes. If rice is still not plump, add ½ cup more stock and simmer covered for another 15 minutes. While the rice is cooking, slice the zucchini lengthwise and blanch in boiling water for about 1½ minutes until al dente. Make sure not to overcook and that the zucchini is not soft. Remove zucchini and add corn kernels and lima beans for 1 minute. Dice the blanched zucchini, then add to a bowl along with the corn and lima beans. Dice roasted peppers and scallions and add to the bowl. Make dressing by mixing together all the ingredients and then add to the vegetables. Toast pecans and sunflower seeds and set aside. When rice is cooked add to the bowl with vegetables, then add the nuts and mix through. Add salt and pepper to taste. Refrigerate until chilled before serving, about 2 hours. This entry was posted in Blog, Recipes and tagged gluten free, Pecans, Rice salad, Wild Rice, Zuccchini on April 27, 2014 by Leslie.